Southern California's largest free concert series, THE TWILIGHT CONCERT SERIES, announces the dates and lineup for its 32nd annual season presented by Snapchat. Returning to the iconic Santa Monica Pier, the all-ages event soundtracks the SoCal summer life every Thursday beginning July 7 through September 8 from 7:00-10:00 PM. R&B/Soul Mayer Hawthorne & Alina Baraz [7/7], Indie Rock/Pop BØRNS & Porches [7/14], Classic '80s Psychedelic Furs & Day Wave [7/21], Reggae Proteje & The Indiggnation & Raging Fyah [7/28], Latin Natalia Lafourcade & Monsieur Periné [8/4], 90s Alt Save Ferris [8/25], Indie Rock Unknown Mortal Orchestra [9/1], Disco Ohio Players with artists for August 11 and 18 to be announced in mid-June. Snapchat is collaborating with The Pier to bring a myriad of new experiences to THE TWILIGHT CONCERT SERIES, such as carnival-style activities and art installations, including one by FriendsWithYou. This expands upon the popular 2015 Snapchat booth, which included games such as "Grab-A-Ghost," "Whac-A-Boo," and "Bye Bye Ghost." 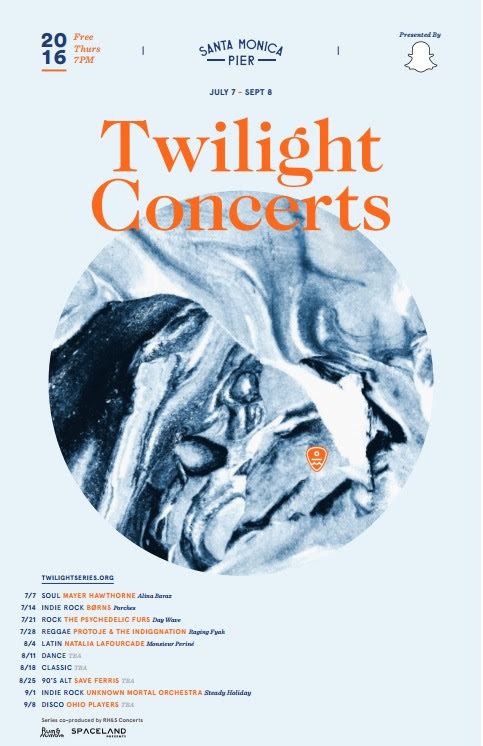 The Twilight Concert Series is a co-production of the Santa Monica Pier Corp. and RH&S Concerts. 2016 media partners include KCRW and Alt 98.7 (LA's Alternative).